Every bottle collector born any time after 1980 (myself and my co-digger, Kyle, included) tends to hear, at every bottle club meeting, show, communal dig, house call, luncheon, box social, etc., about these legendary “factory dump” digs from way back when. Way back when “all this was corn fields” and “old Mr. Robertson’s soda works were run out of his home over on Third street before they tore it down in 1970 and we took 75 intact Robertson ginger beer bottles out of the basement of the place... all of them still in crates... with contents.”. Of course, this is a kind of generic representation of the stories I’ve been bestrewn with at such events, you understand. The stories are great by any measure, but the only thing about being part of such a late demographic in the history of bottle digging is that you know, deep down, that most of those soda works are gone now. Or, at least inaccessible - buried underneath shopping malls and gas stations on the outskirts of every small to medium sized town in Ontario. You know that you as that 10 to 27 year old minority of diggers will never have the chance to dig any such dump, live any such ideology, or experience any such euphoria. The only thing you have to remember when you reach such a depressing state of reluctance to dream about what could be, is that you must continue to dream about what could be. As I’ve said – you absolutely never know what lies ahead in your future. I don’t believe in fate. I don’t believe in being fated to never dig such a dump! Our story begins sometime early in the spring of 2007. It is a Wednesday, and as always happens on Wednesdays, my father pulls up the drive way on his way home from work, gets out, grabs the mail from our large, blue-painted loaf-style mailbox (which I might add is also unique in that it has the single highest mortality and reincarnation rate via snow plow out of all the mail boxes I can think of), returns to his car, and pulls up to the house. The fact that it is Wednesday means that the local weekly paper, the Age Dispatch out of Strathroy, has been delivered. (By the way, I swear this is actually going somewhere – I just can’t help but embellish my stories a bit... or a lot. It increases the anticipation for a more dramatic climax!) My mother traditionally sits down and reads the paper on Wednesdays after it is delivered, and this day was no exception (riveting, eh? Feeling the anticipation yet?). At the dinner table, she sometimes informs us of upcoming and important events in the community derived from this reading, and this day was no exception here, either. She mentioned casually that some plans had been announced for a new, private medical clinic near the downtown of Strathroy, and the demolition of a local iconic bar, as well as several homes had to be completed to make way for it. I didn’t think too much of the announcement, save interpreting it as yet another change in the face of small town Strathroy, which has already come a long way from its roots. Later that night, sitting at my computer, wasting time, as teenagers often do when there are more important things that could be accomplished, I received a call from Kyle. I could tell he was somewhat excited by his tone, and he proceeded the read excerpts from the same article my mother had mentioned that same night. Apparently Kyle had already heard about it, and through his co-op course at the museum, had learned that each of the three homes being demolished were century yellow brick houses, and one of them was rumoured to have been a soda works of some kind, potentially Taylor’s himself! As always happens, we were instantly excited, and began discussing the incredible potential for such a place – not to mention what local ale bottles could lay in the privies behind the place! Even soda makers drank alcohol! Time passed, though, as time always does, and the thoughts were more or less lost... at least temporarily. We figured if the place was being demolished any ways, the home owners wouldn’t mind us digging around – maybe even looking in the basement of the places! However, discouragement inevitably arrived as we hit the first of many roadblocks – we could not, for the life of either of us, get a hold of the home owners! We tried day after day – a dozen times at least – knocking on the door, phoning, etc. Had they moved out already? We finally thought we had lucked out when a lady came to the door one bright summer day when casually dropping by with a few friends. Perhaps she didn’t like the prospects of even two teenagers digging in her previous yard, no matter how short lived, or maybe her interpretation of twice that number (the number that were with us that day) ripping holes in the sod was what did it. Either way, Kyle & I received only the 4th or 5th “No.” in our entire permission-asking history. That’s usually a low blow. I tried to rationalize, but she was convinced there was nothing there, as a relative of hers had apparently dug the place up completely, and didn’t find a shard of glass. Heard that one before? Either way, we continued to focus our attention on the other two houses... until we found out the middle one was vacant already, and owned by a fellow from a nearby town, whom it was difficult to get a hold of, let me say. So difficult, as a matter of fact, that I never did. That last house was our last chance before the big demolition day. But, still, no one answered. Eventually, we just gave up. Then, in early November, Kyle called and left a message saying few words – but very powerful ones in their nature. The message read “Move out date is November thirtieth.” I knew exactly what he was talking about, despite not having tried to gain permission for over 2 months. We figured, “Hey – what harm can one more try have?” So, closer towards the end of November, we were both in Strathroy for the local Santa Claus parade on November 24th, when we decided to knock on that door one more time. The same weekend as our bottle club meeting in Delaware, Ontario. The weather had just started to get really cold – skin piercing cold. Shielding myself from the wind, I stepped up on the featureless concrete porch. “Knock, knock!” rang the onomatopoeia. Much to our surprise, not only did a man exit the side entrance second later, but his wife came to the door we were knocking on at the same time he exited. We explained who we were, what we did, and how incredible grateful we were having finally gotten a hold of her! I asked if any one had ever found anything in the back yard that she knew of. She proceeded to tell me that she had found shards of glass in her garden, and that a fellow had come in and dug around in the crawl space about a year before looking for old bottles, but he hadn’t found anything intact – just lots of shards. But she didn’t think there would be anything in the yard. Sounded interesting – even shards in a crawlspace! Unprecedented for us! So, I asked the big question. “Do you mind if we poke around in the yard a bit, just in case there is something there?” She was silent for a moment and gave a bit of a grimace and asked us to check with her husband in the backyard. So, we thanked her, and went around the side of the house. The moment I saw this man, I knew he would be a good guy. A bit of a handlebar moustache, coupled with mildly greying hair, and wrinkles around his eyes that looked like they could have come from nothing but smiling whole-heartedly. Again, we introduced ourselves, and, again, asked the big question, “Do you mind if we probe around a bit?” No hesitation this time, as his eyebrows raised, and his mouth contorted into an unusual smile to indicate a sort of curious indifference. “Sure,” he said, “poke all you want. We’re just moving things out still, and we’ll be back and forth a bit.” I made sure to quickly ask if we could dig a couple holes, too, and he nodded in approval – once again showing his indifference. “Rip the place apart – you don’t even have to fill them in if you don’t want.” Sure enough – his kindly looks had betrayed his personality – and he was a good guy. We grabbed the probes from the car, and began to poke everywhere – starting with the back corners, as the traditional privy location. The yard looked good. There was a short addition, maybe 8’ long off the back of the house, and a small shed in the rear corner – those being all that stopped us from probing every square inch in pursuit of century old glass! A pair of hedges, probably forscithia, ran along either side of the yard, and the driveway ran along the north side of the house into the yard. As in many of the yards we dig, this one exhibited one inexplicable characteristic – a thick layer of bricks and ash, around 6-10” thick, all over the yard, and buried about 3” down. Probing seemed to be rendered practically useless by the amount of the stuff, as everywhere you put the steel into the ground, you would find the same, reliable sound awaiting you. “Crunch, crunch, squeal!” sang the probe and the ground in slight dissonance. It didn’t sound like the trash layer of mint condition R. Taylor sodas we were hoping for. Kyle, just for curiosity sake, opened up a hole behind and to the north of the back. Bam! That’s when it started to happen. Instantly, shard after shard from aqua, thick-glassed, quart soda bottles began to pop out – It wasn’t long before a shard emerged that had “STRATHROY” visibly embossed on part of it. Now is when we started to get truly excited! I began to expand a hole I had started after probing and hit a slightly thicker trash layer on the other side (south side) of the addition off the back of the house. Once again, I immediately began to hit shards. Out popped the base from a thick, aqua-coloured Ontario soda, with a large, ornate “M” on the base. I threw it to Kyle asking what he thought. “Holy [expletive] – a Murdoch!” he yelped. I had found a shard from one of Strathroy’s other nice pictorial sodas – the G. E. Murdoch - a quart piece with an ornate scotch thistle on the front! I was excited, as neither of us had ever dug a piece from this tough Strathroy soda! The next shovel full only revealed more, though – as shards of glass continued to pour out of the ground like the snow had fallen from the sky earlier that day – and nearly every one of them could be attributed to a Strathroy bottle, with some of the exceptions being J. Tune from London, Pilgrim Brothers from Hamilton, T. H. Hutchison from St. Thomas, York Springs from Toronto (in awesome yellow green shades! ), and Sharp & Kirkpatrick from Sarnia. Most of these occurred in 30 ounce and 6 ounce sizes, as well! Shard after shard – it wouldn’t stop! I was in a daze! 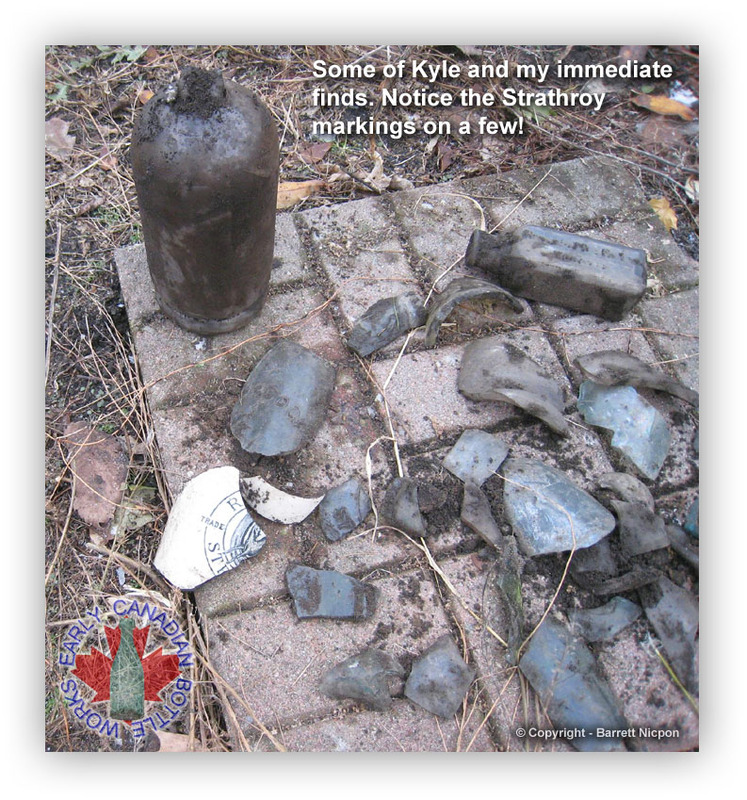 Kyle was finding a similar number of shards on his side of the yard – including a couple small pieces from ginger beer bottles! When I pulled one such ginger beer shard from the ground, I couldn’t help the inevitable thought that... “Perhaps... just perhaps, these ginger beer shards are from the legendary R. Taylor ginger beer bottle!” No sign of any marking was visible on my shard, though, so I rapidly extinguished the thought, knowing how rare and valuable these pieces are. The occasional ginger beer shard continued to emerge from betwixt the glass shards... and all of a sudden. “R.”, “TRADE”, “STR”, and the front part of a horse leaping through half a horse shoe was visible on one such shard. “You ever think we’d find one of these, Kyle?” I asked, and tossed him the shard. He was too surprised to even say anything. For years, Kyle & I had been indoctrinated with the belief that we’d probably never even find a shard of one of these rare and beautiful ginger beer bottles. Kyle had always reinforced that thought, but I always reminded him in turn, “You never know, Kyle – they were bottled here in this town, we could find one intact at any time.” I wasn’t quite right yet, though. 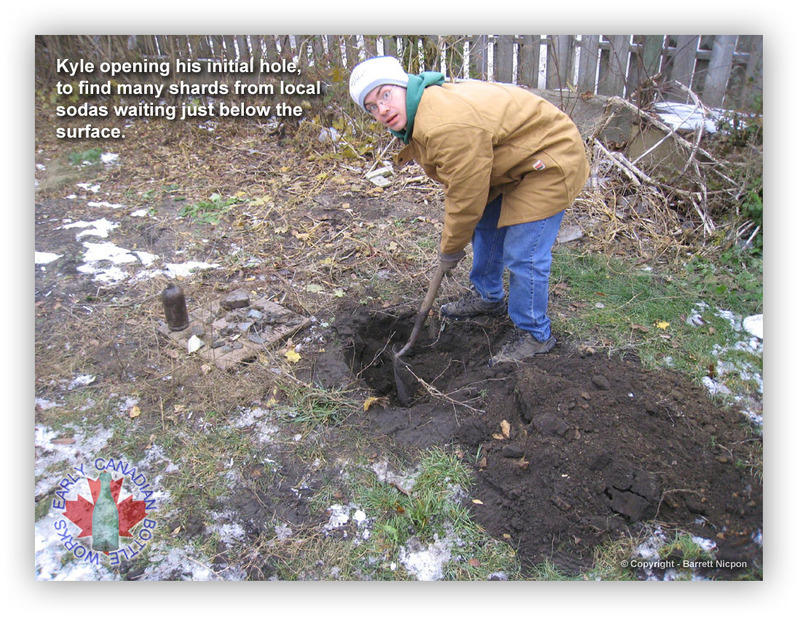 Kyle & I dug for about another hour, including the opening of several additional test holes across the yard of the house – most of which resulted in the discovery of additional shards from mostly Murdochs and Taylors. We pulled a few additional shards from R Taylor ginger beers, and even a clear Horton & McGregor Chatham Seltzer bottle, badly cracked and with the top knocked off, but as “intact”, as either Kyle or I had ever found. And then, suddenly, I realized something. This was above us. There was no way two amateur bottle diggers like ourselves could possibly undertake something like the excavation of the entire backyard of a soda works by ourselves – the magnitude was just too huge! So, we conference, and decided to give a call to one of the only fellows who would, a. ), appreciate the discovery for more than aesthetic or monetary reasons, and b. ), be trusted with the site. Jim Butler – the resident Strathroy bottle collector - and a man who had never had the luck of pulling an intact Strathroy bottle out of the ground, was our man. He had mentioned to Kyle and myself on several occasions the exasperation he had felt towards his lack of accomplishment on the level of bottle digging in general. We figured this would be a good time to get him to find something good – and there was no way we could find everything there was to be had before it was destroyed by the houses being knocked down, and excavation by heavy equipment. After all, the demolition date was only a little over a week away! Kyle called Jim, and let him know of our predicament... perhaps predicament not being the best word. Jim was curious about the dozens of glass R. Taylor and G. E. Murdoch shards, and I’d imagine we could have counted him in for a dig after just those. When Kyle mentioned those R. Taylor ginger beers shards though, I could almost hear his excitement and surprise through Kyle’s phone, while 8 feet away. “He’s on his way down, he said.” Kyle announced very shortly thereafter. We had a third party member. Maybe we had a shot at finishing this thing. Jim showed up, and the three of us ripped the yard apart. I uncovered half a JOSEPH BILTON / LONDON hutch soda, as well as an intact, though unmarked, amber soda bottle with a tooled crown top. 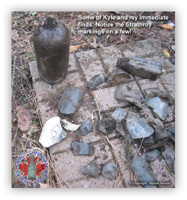 Jim found an unembossed crown top soda with the lip missing, and Kyle pulled out a nonesuch stove polish bottle, with the Toronto marking, and an unmarked medicine. We all found shards from Taylors, Murdochs, and all the usual stuff. No intact Ontario sodas after hours of digging, though! And certainly no Taylor ginger beers intact! We were disheartened. Normally we reach a point such as this in every bottle dig, though, and whenever we do, we nearly always make it through it. So, really, we weren’t disheartened - only a little nervous about the apparent lack of intact bottles. Then Kyle made an exciting discovery! After digging for several minutes without anything more than the usual shards, he suddenly popped out of his hole with the entire bottom half, from the shoulder down, of one such R. Taylor Ginger beer! We all gasped, and were duly impressed! We had begun to think there were no pieces of ginger beers larger than the palm of a hand, but this spelled potential for the future! We all began more excitedly digging. Kyle unearthed an unembossed hutch soda with the lip broken off, and several large pieces of Taylors, and it seemed he was finding every thing... we rarely reflected on the fact that few pieces were intact – it was too exciting digging shards like these! And exciting shards they were! If you were pulling these out of any other bottle dump, you’d be impressed and set them aside, as well! Out pops the entire base from a dark amber Wilson quart all the way from Toronto, and then the front face from a medium amber J. Tune quart out of nearby London! The number of bottle shards was just staggering! One such shard appeared to be especial interest to Jim. I had unearthed a number of shards of a clear, quart soda bottle with embossing “G.E. MURDOCK / STRATHROY” – though in several pieces from several bottles, so none of them clearly displayed all the embossing on the same piece. The unusual part of this bottle is that all known quart G. E. Murdock bottles have a thistle pictorial on the front face. Although unspectacular to look at, we had succeeded in unearthing a shard from a Strathroy bottle not previously known to exist! We continued to dig the day away until it became dark out. As the light faded, our spirits did not, and we realized something awful (as oftentimes do during these digs, but, again, normally persevere). We were going to have the skip the bottle club meeting which was taking place the next day, in order to pursue this higher priority! We were all convinced that there was much more to be had here than was apparent from the first day of digging primarily shards, so we vowed to make it back as many times as was possible before the move out date of November 30th. In the 3 or so hours we dug this day, we had not stopped finding shards at any point, and this spelled good news for the future! Who knew where there was a pocket of those R. Taylor ginger beers all laying intact beneath the ground in that yard? Who knew what vast variety of Ontario sodas, especially Strathroy ones, were to be had? If anything, after 3 hours of digging nothing but shattered bottle remains, we were more uplifted than when we started! The bottle club meeting would wait until the Month of February. After all, we needed something to show off at it! We had to find a couple of those R. Taylor ginger beers at least somewhat close to intact! When the light fell, Jim headed home to his wife, whom had been calling him and, rationally, wondering when he would be home to eat dinner, while Kyle & I headed back to my residence at the University of Western Ontario, to celebrate his birthday (which was the day after). We all agreed to meet back the following day at around 10:00, and continue to dig this yard until it had nothing else to offer. We’d make Kyle’s birthday a good one yet.